To compute variances that can help you understand why actual results differed from your expectations, creating a flexible budget is helpful. A flexible budget adjusts the master budget for your actual sales or production volume. For example, your master budget may have assumed that you’d produce 5,000 units; however, you actually produce 5,100 units. The flexible budget rearranges the master budget to reflect this new number, making all the appropriate adjustments to sales and expenses based on the unexpected change in volume. To prepare a flexible budget, you need to have a master budget, really understand cost behavior, and know the actual volume of goods produced and sold. Consider Kira, president of the fictional Skate Company, which manufactures roller skates. Kira’s accountant, Steve, prepared the overhead budget shown. Skate had a great year; actual sales came to 125,000 units. However, much to the disappointment of Steve and Kira, the overhead budget report reported major overruns. For each category of overhead, Steve computed a variance, identifying unfavorable variances in indirect materials, indirect labor, supervisory salaries, and utilities. 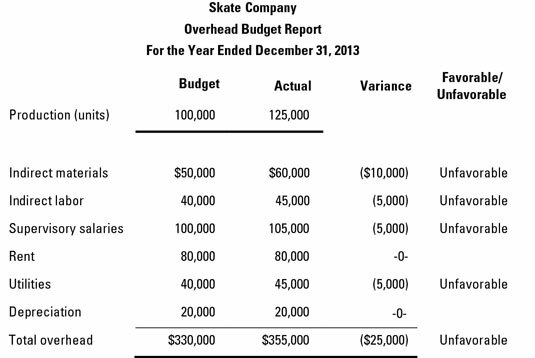 Skate’s total overhead exceeded budget by $25,000. Steve made the elementary mistake of treating variable costs as fixed. After all, portions of overhead, such as indirect materials, appear to be variable costs. 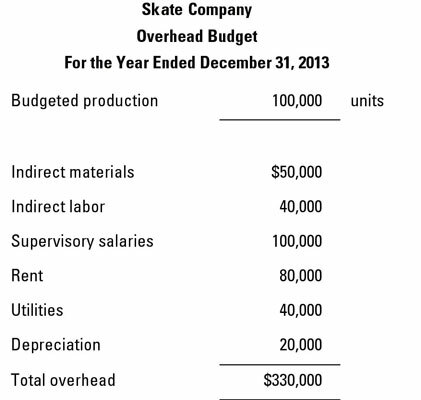 If Skate increased production from 100,000 units to 125,000 units, these variable costs should also increase. In other words, comparing the $60,000 actual cost of making 125,000 units to the $50,000 budgeted cost of making just 100,000 units makes no sense. You’re comparing apples and oranges. Instead, Steve should flex the budget to determine how much overhead he should have, assuming that the company makes 130,000 units. Some costs are variable — they change in response to activity levels — while other costs are fixed and remain the same. For example, direct materials are variable costs because the more goods you make, the more materials you need. On the other hand, some overhead costs, such as rent, are fixed; no matter how many units you make, these costs stay the same. To determine whether a cost is variable or fixed, think about the nature of the cost. 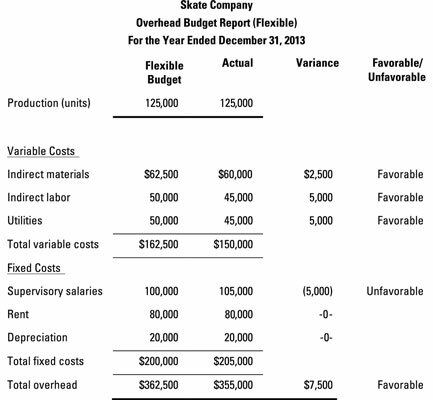 For Skate, an analysis indicates that indirect materials, indirect labor, and utilities are variable costs. On the other hand, supervisory salaries, rent, and depreciation are fixed. Steve recomputes variable costs with the assumption that the company makes 125,000 units. 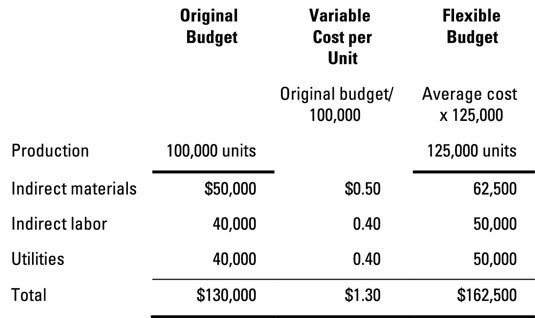 In the original budget, making 100,000 units resulted in total variable costs of $130,000. Dividing total cost of each category by the budgeted production level results in variable cost per unit of $0.50 for indirect materials, $0.40 for indirect labor, and $0.40 for utilities. To compute the value of the flexible budget, multiply the variable cost per unit by the actual production volume. Here, the figure indicates that the variable costs of producing 125,000 should total $162,500 (125,000 units x $1.30). The next step is to combine the variable and fixed costs in order to prepare a new overhead budget report, inserting the new flexible budget results into the overhead budget report. Look at that! After you adjust for the change in production level, Skate’s variance is suddenly favorable. Actual overhead of $355,000 was $7,500 less than the $362,500 flexible budget.